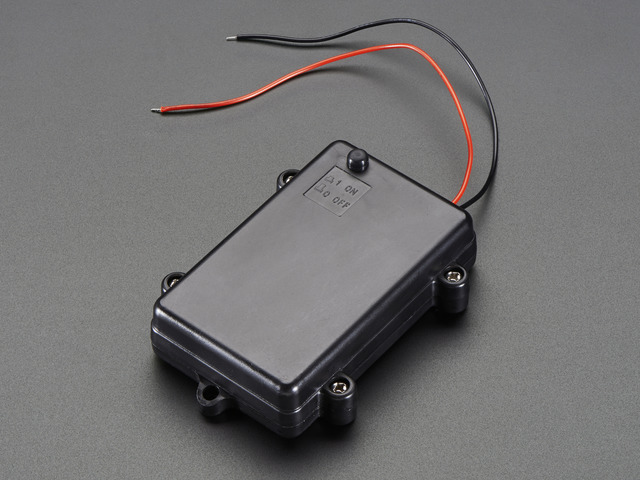 Your battery box may look a little different than the one in these photos. If necessary, strip some insulation and twist & tin the end of the wires (melt a little solder into the strands to keep them from fraying). Insert 3 AA alkaline batteries (or 4 NiMH if you’re using that type). Make sure it’s switched OFF for the time being. These levers require a LOT of force to open! Young makers might need a parent’s assistance with this part. They also snap shut quite forcefully, so be careful. 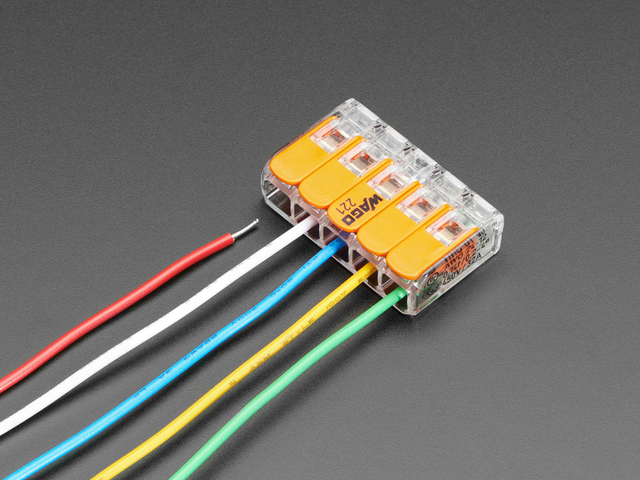 Insert the + and – leads from the battery box into separate block connectors and snap the lever shut. Look down the hole to make sure it’s clamped down on bare wire, not the insulation. Strip about 1 cm of insulation from the end of each long wire (2 each from the Arduino, Bluetooth board and both ends of the NeoPixel strip — 8 wires total). If stranded wire, give the ends a slight twist and then “tin” the wires with a little solder. Open the remaining levers on the block connectors. Insert all of the power wires into the corresponding connectors (all + in one connector, all – in the other) and snap the levers shut. Give each a gentle tug to make sure it’s got a proper hold. Connect the JST plug to join the Arduino and NeoPixels. If all goes well, you should get a solid blue light from the underside of the Arduino, and a pulsing green light on top. After about 10 seconds, the pulsing should change to a fast blinking. Good news! That means the code’s running, the wiring’s right, and the Bluetooth interface is awaiting a connection. Did you install fresh batteries in the case? Are they each oriented the correct way? Look for electrical shorts; + and – may have inadvertently been crossed somewhere. Examine the block connectors closely. Are they biting down on wire, or on insulation? Switch off the battery and try connecting a USB cable. If the computer complains that a device is drawing too much power, that’s almost certainly an electrical short. Something’s probably gone amiss when uploading the code to the Arduino. Go back to the “Code” page and try those steps again. Are you using an Arduino Micro or Leonardo board? Other boards like the Uno don’t have quite enough RAM, and the code will just hang. To communicate with the Arduino, you’ll need a late-model Android or iOS phone or tablet (must support Bluetooth 4.0 / Bluetooth Low Energy both in hardware and the OS). 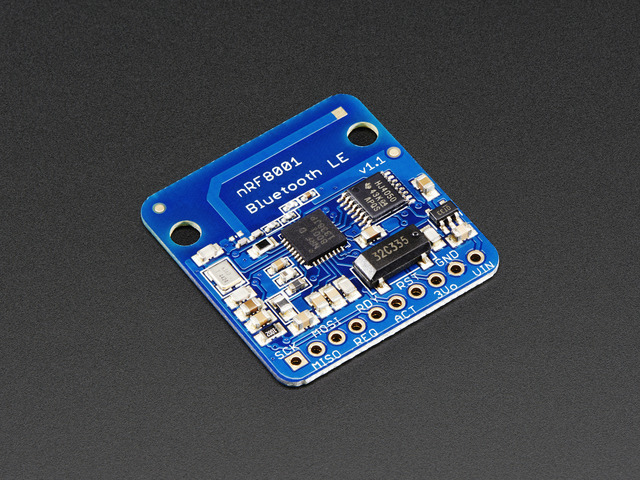 Install either the nRF UART app (available for both Android and iOS) or the Adafruit Bluetooth LE Connect app (iOS only). The status LED on the Arduino board will flash quickly while it awaits a Bluetooth connection. Running one of the above apps on your phone or tablet, select “Connect” or “UART Monitor.” You may need to select the Bluetooth device from a list. 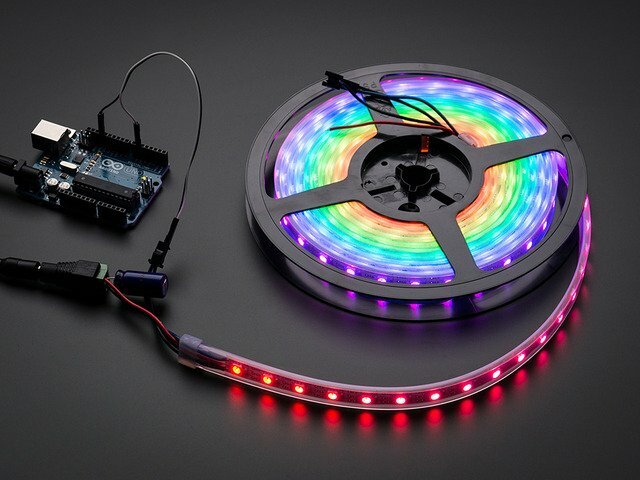 Once a connection has been established, the LED on the Arduino will flash slowly to indicate that it’s working. If you’re having trouble establishing a connection, try working though the Getting Started with the nRF8001 guide first. Once that’s working, re-upload the Guggenhat code to the Arduino. Type “HELLO” and press “Send.” This should scroll the word around the hat, illuminated in red LEDs. Try other messages…anything up to 20 characters max. Later we’ll explain how to change colors. Count the number of pixels around the circumference of the hat. Don’t include the same column twice. Edit the Guggenhat sketch and change the WIDTH value to this number. Re-upload to the board. Once you’re satisfied that everything works, switch the power off and we’ll do the final assembly. This guide was first published on May 01, 2014. It was last updated on May 01, 2014. This page (Dry Run) was last updated on Apr 05, 2019.